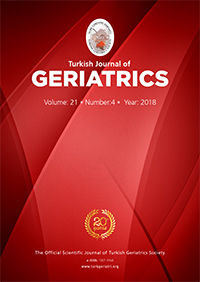 1Muğla Sıtkı Koçman University, Training and Research Hospital, Department of Anesthesiology and Reanimation, Muğla, Turkey DOI : 10.31086/tjgeri.2018.57 Introduction: As the world"s population is ageing, accurate prognostic prediction in critically ill elderly patients is becoming increasingly important. We aimed to assess the performance of the Acute Physiology and Chronic Health Evaluation IV and Simplified Acute Physiology Score 3 scores in predicting outcome in elderly patients admitted to the intensive care unit. Materials and Method: In this study, we retrospectively evaluated the patients over 65 years who were followed in the intensive care unit between 2016 and 2018. Acute Physiology and Chronic Health Evaluation IV, Simplified Acute Physiology Score 3 and predicted mortality rate were calculated using a web-based calculator and the predictive mortality performance of these scores were evaluated. Results: Total mortality was 37% (n=74). Mean Acute Physiology and Chronic Health Evaluation IV and Simplified Acute Physiology Score 3 scores were 87.73±41.24 and 54.87±25.44, respectively. Mean predicted mortality rate according to Acute Physiology and Chronic Health Evaluation IV and Simplified Acute Physiology Score 3 was 41.82±32.76 and 34.60±34.57, respectively. The area under the curve was 0.89 for Acute Physiology and Chronic Health Evaluation IV and 0.91 for Simplified Acute Physiology Score 3. The Hosmer?Lemeshow statistics showed poor calibration for Simplified Acute Physiology Score 3 (p<0.01) and strong calibration for Acute Physiology and Chronic Health Evaluation IV (p> 0.05).